One consideration to make when you travel somewhere is whether to purchase souvenirs for your relatives or friends at home, and what to get for them that would be worth getting and spending your money for. Souvenir means ‘remembrance’ or ‘memory’, so it’s something that would remind you or the recipient of the place where it came from (or the person giving the souvenir). So you would like it to be something that the recipient would appreciate to get, and if it’s from a place you visited, it’s something unique to the place or represents the place. Other obvious considerations would be the cost, and potentially the size and weight of the souvenir to carry with you on your travel (perhaps also whether it’s legal to bring those back to your home country). Another not so obvious consideration is the source where you’re getting the souvenir from. Most people don’t really care as much about this factor (in the US, often times we would look for souvenirs from famous landmarks/places like the Empire State Building or Washington DC’s National Mall and find that those were manufactured overseas where the cost was much lower). But when you visit a developing country like Cambodia, sometimes this could make a big difference for the local people who make the souvenirs as you help provide them with the income they need. After a whole day of touring around the Angkor Archaeological Park, we ended our day after visiting the Bayon temple inside the Angkor Thom complex. Before we headed back to our hotel, on the way our tour guide Vanna asked us if we would like to stop to look for any souvenirs from Cambodia, knowing that the following day would be another full day of sightseeing and we would go directly to the airport to leave Cambodia after that. I was thinking of possibly looking for some souvenirs for my friends later that night around dinner time, but I thought why not, we had some time and if it’s on the way, we could stop by to look around. So Vanna and Hour our driver took us to a store called D’mouj in Siem Reap on the way to back to our hotel. Vanna said they would wait for us in the van while we spend some time checking out the goods at the store. When Kristi and I entered the store, we were greeted by the store manager, an Indian gentleman who welcomed us and asked us if there was anything particular that we would look for. The store had all kinds of objects of arts and handicrafts on display, but the main collection seemed to be carpets and various textile-based products. From reading the guidebooks, I knew that Cambodia was quite well-known for its silk products, so I thought for some of my friends it would be nice to get silk scarves if the price was reasonable, as those would be quite light and easy to pack and carry in our travels. The store manager showed us the section of his store where he had the selection of silk scarves. They were quite beautiful and looked very nice. After picking some that we thought would match the color and patterns that our friends would like, we looked at the price, and found out that they vary quite a bit. I asked the manager why that was the case, and he said though all of the silk products there were hand-woven, they varied in quality, and also some were made locally in Cambodia while others were imported from his homeland, the Kashmir region of India. And though I couldn’t tell the difference as much, some of the scarves were silk, and some were actually cashmere wool. Either way, they’re high quality products. We asked the manager to point us to selection that was made of silk and came locally from Cambodia, as we wanted to bring back souvenirs that are actually from Cambodia, not just bought in Cambodia but made elsewhere. We found the ones that were reasonably priced (expensive for Cambodian standard, but reasonable in comparison to the price overseas). When the manager had his staff processing the credit card payment for our purchase, we had a nice conversation with him. He asked us where we’re from and where else we were going to go. When we mentioned that we’re from Indonesia, and we’re going to go to Vietnam and Singapore next, he mentioned that he’s been to Indonesia before, and that his family actually had another store in Hanoi, Vietnam, as well. He mentioned that though his family was originally from Kashmir, India (the region that had its share of war / conflict in the last few years), they had been away from home and lived and did business in Southeast Asia for years. He also said that he liked living in Siem Reap and going around the Southeast Asian region in general, and hoping that they would be able to expand their business to other cities in the region. After finishing our purchase, we said goodbye to the store manager and left the store. We got the souvenirs that we wanted to get, so at least that’s one thing less to think about before continuing our trip. Now looking back, I thought it might be better had we gone to more ‘local’ store that was owned and run by Cambodians where we know the proceeds from the sales go to the locals, and who knows, Vanna and Hour might’ve taken us to that store because they got some kickbacks from the store for the purchase we made (pretty standard practice in tourism everywhere). Oh well… at least we had an interesting experience to remember, and we did get souvenirs that we were looking for and that the recipients did appreciate. 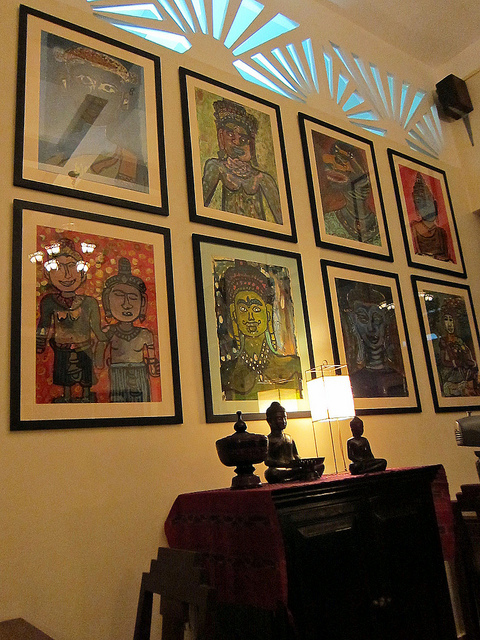 The photo below was taken during our dinner at a restaurant in Phnom Penh called Romdeng. It’s a restaurant run by an NGO with a purpose of providing street kids in Phnom Penh with some training in the hospitality business. The artwork hanging on the wall were done by some these street kids, and they had them for sale with proceeds going towards improving the welfare of the kids and their families. It’s an example of a socially-responsible tourism. This entry was posted in Photography, Travel and tagged cambodia, d'mouj, siem reap, silk, souvenir, travel experience by setiawanphoto. Bookmark the permalink.